The rear of my Jeep Scrambler was in need of some work. When I had replaced my body mounts, I needed to cut access holes to get at the 'captured nuts' that had managed to escape - a very common (and irritating) problem. Additionally, I wanted to add some protection for when I get it back on the trail. So I called Dan Duffy, owner of Off Your Rocker. Dan was very helpful. We talked about some of the options available and I decided to go with some custom corner panels. The panels I got were flat steel as opposed to their normal diamond tread pattern. 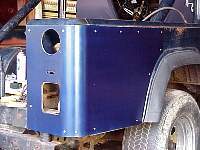 ORY panels normally come powdercoated - I ordered mine unfinished so I could paint them to match the body color. When the box was delivered, I was surprised at how heavy it was. 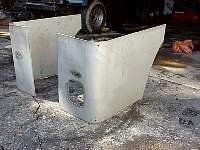 I'd installed a set of aluminum corners with a friend a few yeras ago - these corners are NOTHING like aluminum corners. These suckers are thick. The bend around the rear corner was a perfect fit. 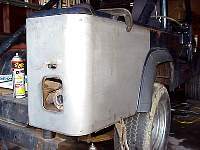 The cutouts for the gas tank and taillamps were an excellent fit. This is how my corners came out of the box. They are a very heavy duty 1/8" thick steel plate. 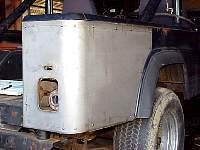 They were pre-cut for the stock gastank filler as well as the stock wiring access holes for the rear taillights. There is no real way to make these come up perfect, especially on the rear of an imperfect Jeep. But they don't need to be - just have to be close enough to allow the wires gas filler neck through. The first thing you need to do should be obvious. Remove everything you've got bolted up to the rear of the body. 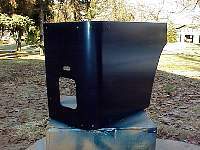 This includes the stock tire carrier, gas tank filler and taillights. Ten minutes with an impact gun and some generous use of the ever present PB Blaster and you're done. 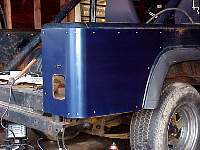 (Note: You lucky bastards on the left coast may not need the PB Blaster) After that, you need to get the panels aligned with your Jeep's body and clamp it on. I managed to do this by myself, but a friend would make it go quite a bit quicker. I used a single C-clamp and one vice-grip. After getting it lined up, you need to drill two holes- use the holes that come pre-drilled in the corners as a template. These holes will be the starting point for the rest of the installation. Next thing I had to do was remove the panels and paint them. Yes, this was a pain, but since the holes were already done, it went pretty quickly. If you order your panels pre-finished, you won't have to go through the pain of removing and reinstalling them like I did. Here they are bolted back up. 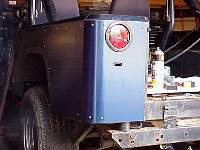 After I get a new drill, I'm going to cut out the stock taillight wiring holes and put in 2"x4" reverse lamps. And here it is all done. Looks great and will take any abuse I can dish out.